Bluejaz Beach Resort and Waterpark is one of the top 10 beach resorts in Samal Island and largest waterpark in Mindanao, Philippines. This 3-Star Resort features many worldclass facilities and amenities to serve its guests: private beaches; a marina; an outdoor infinity pool with poolside bar and a bar-lounge; a gigantic waterslide; children's swimming and paddling pool with waterfall; a toddlers' pool at the childrens' waterslides; wakeboarding, water skiing, kayaking, snorkeling, diving and island boat tours, parasailing facilities in the clear blue waters of Davao Gulf; a restaurant that serves international cuisine, banquet facilities and a picnic area; conference and meeting rooms, with secretarial and translation services, including audio-visual equipment; and waterfront accommodations. It also has free Wi-Fi internet access which allows guests to surf the Net, and chat with families and friends while enjoying the vacation. 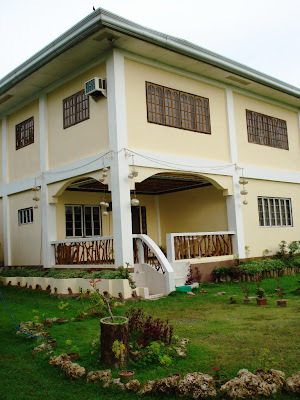 Bluejaz is located in Caliclic, Babak, in the Island Garden City of Samal (IGaCoS), and is only a few minutes away from downtown Davao City. 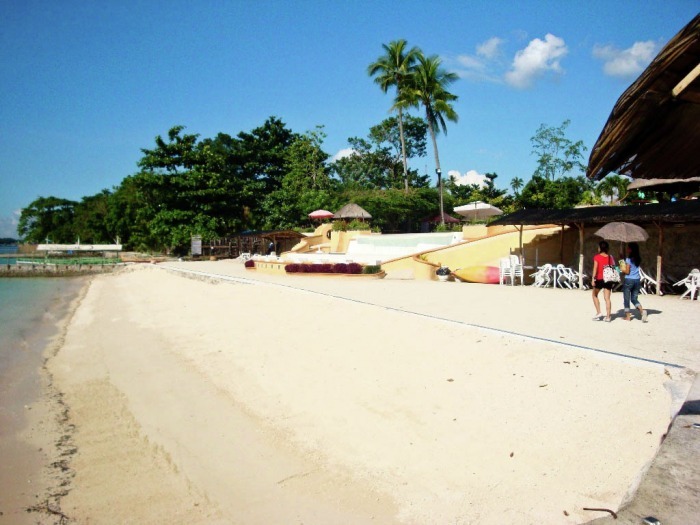 BlueJaz has three beautiful private white beaches. 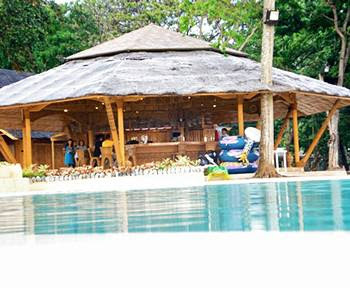 Just about 100 feet from its shoreline is the Resort's own coral reef which has become one of Davao City's top snorkeling and diving destinations. 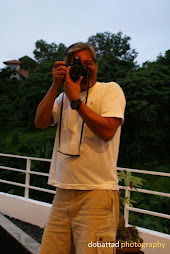 The Resort has in-house dive instructor who assist divers in the daily deep water diving. Fishing trips are also available on arrangement with the in-house dive instructor. 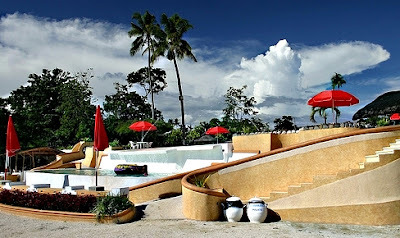 BlueJaz is the largest waterpark in Mindanao with three beautiful private white beaches, eight adult waterslides and flumes, four swimming pools and a spa. 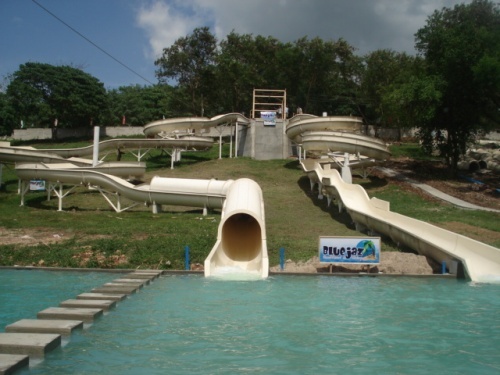 The resort operates Bluejaz Pirates Adventure (below) where children and adults alike can enjoy our three shorter slides located in the children's water play area. 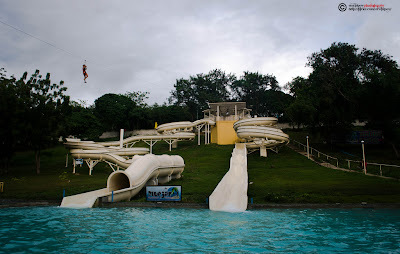 For adults and the more adventurous, the two two gigantic highspeed 300 feet flumes waterslides (above), which are the largest in Mindanao, provide a sudden rush of adrenalin to its riders. The Pirates Adventure slides end at the four-foot deep pool for children aged five and above as well as adults. The Resort also has zipline ride that runs directly above the pool and slides towards the Davao Gulf. 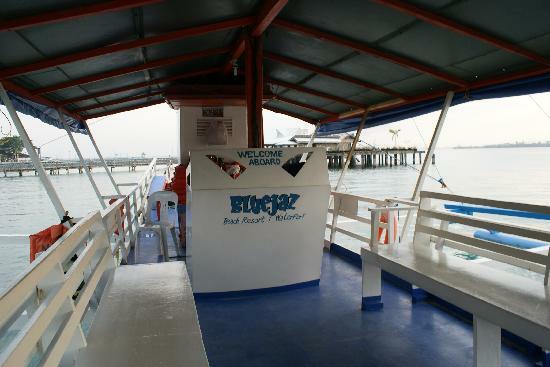 Bluejaz operates its own private boat service which guests of the Resort can avail for a minimal fee. It operates seven days a week and services from mainland Davao City to the resort. First trip is at 6AM, and the last trip back to Davao City is at 5PM. 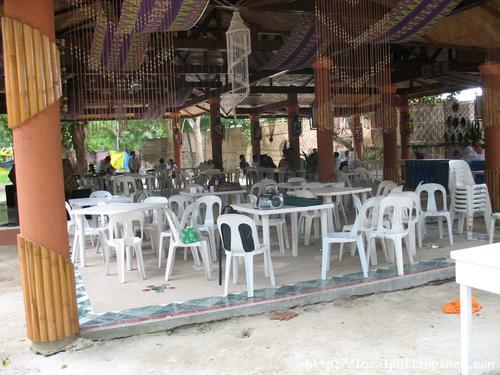 Pick up of passengers in Davao is at The Beachside Resort, Maryknoll Road Barangay Vicenta Hizon. Travel time approximately 3 to 5 minutes. 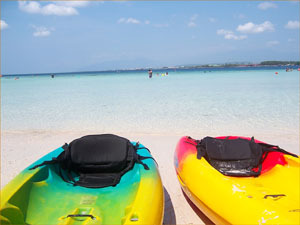 Boat frequency is every 15 to 30 minutes depending on the time of day and demand. Immediate charter service is also available on request. Blue Bling Bar and Restaurant offers a wide variety of local delectable dishes including oriental and international cuisines. It is open from 6AM to 11PM. 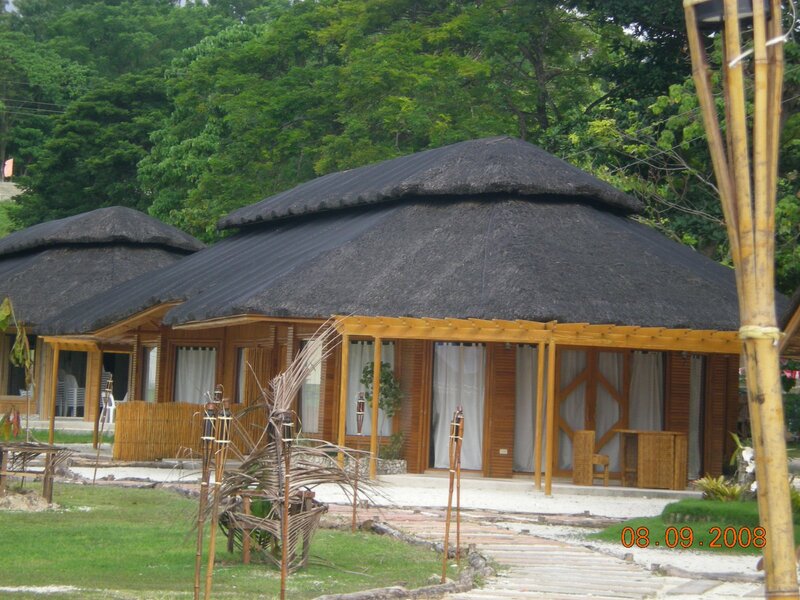 The Bluejaz Pavilion is available for conferences, meetings and other business and social events for all occasions. 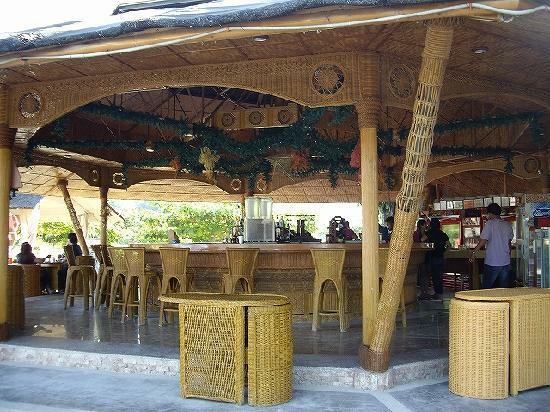 It is equipped with tables and chairs, a mini sound system, and a white board and can accommodate 50 to a 100 guests. 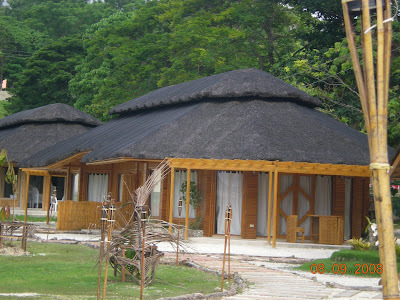 The Resort has well-trained, multilingual staff who are available for wedding services and event catering, tour assistance, and translation services. 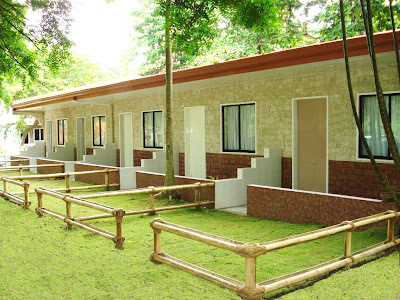 Booking and reservations are preferred by the Resort. 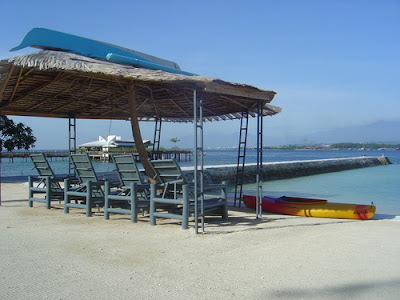 Day Tour Escapade package is available for a minimal fee which includes free entrance, open cottages, use of swimming pools, use of children’s water play area and kiddie slides, free Wi-Fi connection, and boat transfer. Day Tour hours is between 6AM to 5PM only. 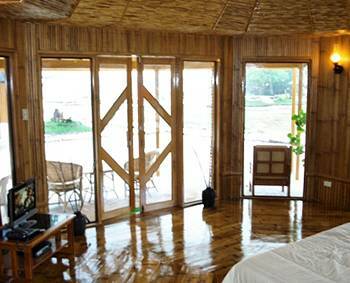 The Resort has 17 breathtaking ocean view room cottages for overnight stay. 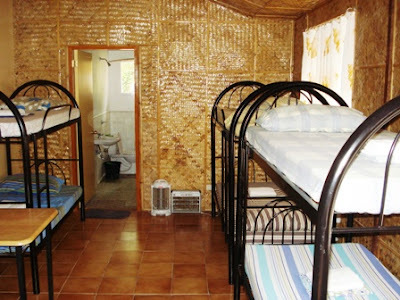 Depending on the type of accommodation used, most of the rooms have sitting areas, comfortable beds, air conditioning units, private showers and bath with hot and cold water shower facilities and complimentary toiletries, telephones, cable televisions, refrigerators, and even cribs for infants. Fiji Style Cottage has a total of four rooms in each cottage which can accommodate two to five guests. 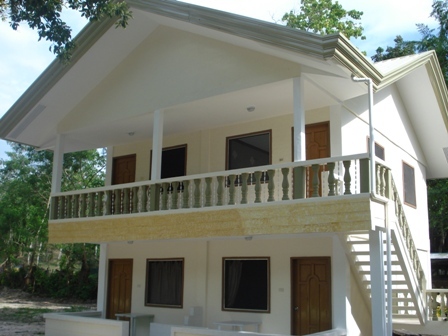 Each cottage features one queen-sized bed or two single beds, with flat-screen TV, complimentary wireless Internet access, an air-conditioning unit, a refrigerator, and ironing service which is available on request. Backpacks Paradise Bunk Room is a non-air conditioned co-ed dormitory-like European style bunk room, furnished with double deck beds, common bathroom and shower facilities. 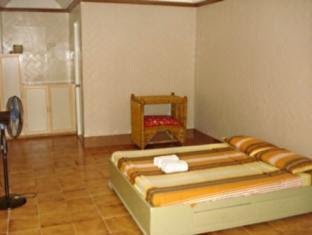 There are 10 Jazmin Rooms which are available for a maximum of two to four guests. 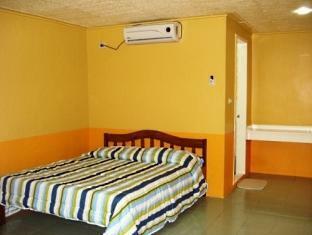 Each room features one queen-sized bed or two single beds, with flat-screen TV, complimentary wireless Internet access, an air-conditioning unit, a refrigerator, and ironing service which is available on request. 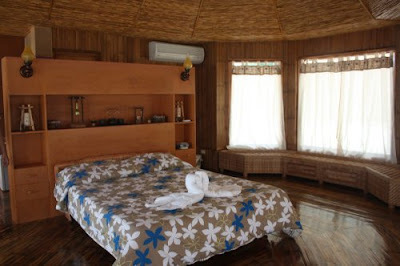 There are two Tropical Rooms, each of which can accommodate up to six guests and it comes with a queen-sized bed. The White House can accommodate eight to twenty guests. It has four big rooms, a private dining area and a TV room. 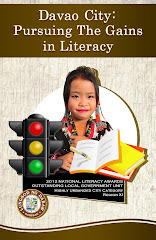 Bluejaz is about fifteen minutes away from Davao International Airport in Sasa. It has its own passenger boat that services Resort guests between The Beachside Resort, Maryknoll Road in Barangay Vicenta Hizon, on the mainland Davao City directly to the Resort. Average boat ride to the Resort is approximately 3 to 5 minutes. I really like to try that Two gigantic highspeed 300 feet flumes waterslides...this is the best resort so far..it has almost all.. This looks like an amazing Water Park Resort! Thanks for sharing. 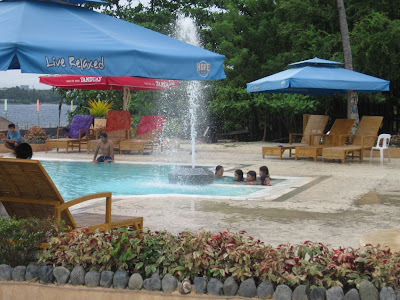 Wow the Bluejaz resort looks like a relaxing vacation for adults and a fun place for kids. The only real water park that me and my family have gone to is the Great Wolf Lodge by us, but we may have to take a trip! wow, what a heavenly place! I would love to spend my summer vacation here. 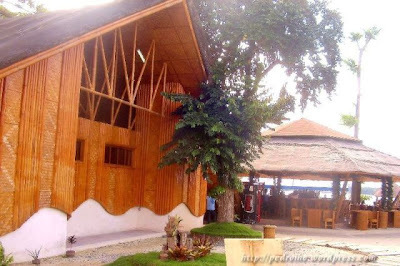 A nice place where you could rejuvinate and be one with yourself or just party all night! hehehe. I hope to visit this place. 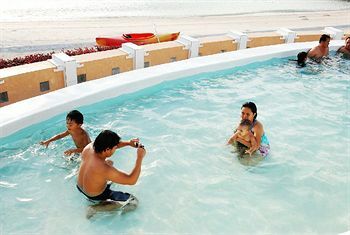 The resort is awesome, lots of activities to enjoy, even for kids... Perfect place for the whole family..